What I admire most about the business ideas and strategies of Nintendo is their ardent desire to try something new, to introduce new customers to the world of gaming and most importantly, to create fun for everyone! After the success of the Nintendo Wii, the company tried to stand on the shoulders of the hardwares success with the follow-up home console, the Wii U. Unfortunately the console never hit its stride and was semi-doomed from the beginning due to its lack of third-party support, confusing approach, lacklustre games at launch and tough competition from the likes of PlayStation, Xbox and even the mobile phone crowd. A battle lost doesn't spell the end for the big N, they have experienced failure in the past and each time they come back with more gusto and creativity to launch "the next big thing" in gaming. They are already underway with their upcoming much anticipated console, the NX (codename), also referred to as the Fusion (DS and Terminal), named so because it is rumoured to combine the best of the portable and home console traditions. 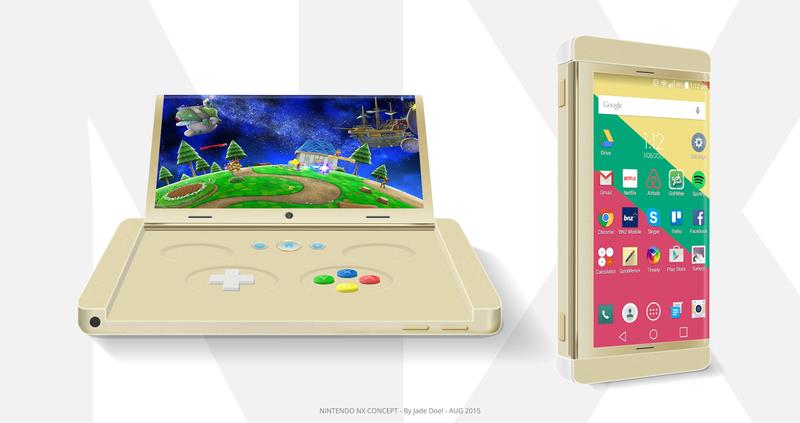 Based on these rumours I've created a quick concept for how I'd envision the NX to look and what features it might include to give it a point of difference compared to other electronic entertainment and utility devices on the market. In NX mode users play games designed specifically for the NX that leverage the devices unique features and controls. When you're at home, place the NX into the Terminal to play your NX compatible games on your TV. The Terminal contains a hard drive and disc slot for disc-based games as well as additional controller that maps the layout of the NX control scheme, minus the dual screen.